Key Difference: Sorting means ordering or categorizing something. On the other hand, Collating is to assemble something in a logical sequence. Sorting and collating are often used interchangeably, but they are slightly different from each other. a) Any of the individual characters making up a font of type. b) Characters of a particular font that are rarely used. To arrange according to sort, kind, or class; separate into sorts; classify: to sort socks; to sort eggs by grade. To separate or take from other sorts or from others (often followed by out): to sort the good from the bad; to sort out the children's socks. To assign to a particular class, group, or place (often followed by with, together, etc. ): to sort people together indiscriminately. Computers. To place (records) in order, as numerical or alphabetical, based on the contents of one or more keys contained in each record. Sorting refers to the process of putting a set of documents or data in a specified order. Sorting, in turn, is needed to allow other kinds of processing to occur. It is most commonly used in ordering and categorizing. Ordering is to arrange things of the same kind, class, nature, etc., whereas, categorizing is to label things and group together things with similar properties. Sorting is most importantly used in computer science because there are thousands or millions of subjects which has to be recorded. Examples like playing cards, algorithms, etc. Searching sorted data is much more efficient than searching randomly-ordered data. Sorting colors, buttons, etc. are also some of the examples of sorting. Sometimes while sorting out, we forget to solve the needed problems. Sorting and prioritizing is necessary. I’m sorting papers according to the numbers of the students. Sorting through what he finds won't be easy though. To gather or arrange in their proper sequence (the pages of a report, the sheets of a book, the pages of several sets of copies, etc.). Bookbinding. To verify the arrangement of (the gathered sheets of a book), usually by inspecting the signature at the foot of the first page of each sheet or the mark printed on the back of each sheet or on the spine of each signature. To compare (texts, statements, etc.) in order to note points of agreement or disagreement. Bibliography. To verify the number and order of the sheets of (a volume) as a means of determining its completeness. Computers. To merge (sequenced data from two or more data sets or files) to produce a new sequenced data set or file. Collating is to assemble multiple copies of printed documents into sequences of individual page order. It is like one sequence for each copy and is especially done before binding. It also refers to the process of comparing two strings to determine which is greater, or if they are equal. 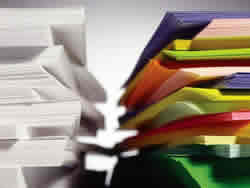 Collating is a fundamental element of most office files, library catalogs and reference books. A collation is also known as a collating sequence. It is a database object containing a set of rules that determines how character strings are compared, searched and alphabetically sorted. Strings basically represent a number that may be sorted based on the values of the numbers. The rules in the collation determine whether one character string is less than, equal to or greater than another. A collation also determines how case-sensitivity and accents are handled. He performs collating, bindery, and distribution functions. Sale persons are collating information of the market. Managers are collating information from many sources. Given that the study was done by collating self-reported data, it was utter non-sense. Thus, sorting is to ARRANGE according to class or size, whereas, collating is to ASSEMBLE in proper numerical or logical sequence.